Understanding the concept of inertia is key to reaping the benefits of flywheel training. Instead of using weights, the resistance in flywheel training is created through the inertia of a flyweel which is rotated with muscle force. Traditional strength training is generally done by lifting some sort of weight – such as a barbell, dumbbell and weight stack machines – against gravity to create resistance. In flywheel training or isoinertial training, resistance is created through the inertia of a flywheel, which is accelerated or decelerated with muscle force. The level of inertia of the flywheel rather than the weight determines the force needed. The principle is equivalent to that of a traditional yoyo device. The resulting force in a flywheel training exercise depends on a combination of the inertia and the intensity you work with. With a higher inertia, the motion will be slower and more controlled, and your muscle will be able to produce a higher force. With a lower inertia, the motion will be faster which also puts higher demands on skill, balance and technique. 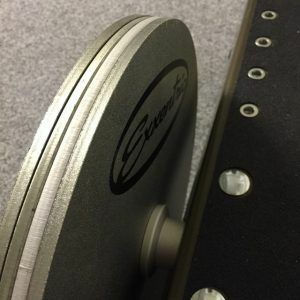 The Exxentric flywheel training devices kBox and kPulley can be equipped with up to four flywheels with inertia ranging from 0.010 kgm² to 0.070 kgm². This facilitates an inertia range of 0.010 kgm² to 0.100 kgm² on the smallest model kBox4 Active, and up to 0.280 kgm² for the largest model kBox4 Pro. In flywheel training, choosing inertia means more than deciding between light and heavy. The inertia resulting from the size and number of flywheels impacts the training adaption you get. 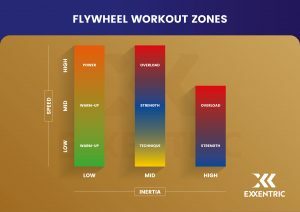 Together with your workout intensity, the the ideal choice of inertia depends on your exercise purpose, also coined the Flywheel Workout Zones. Go back to Physical Principles.